The Big Wobble: A string of deaths described as “unprecedented,” SIX, North Atlantic right whales found dead in the Gulf of St. Lawrence Canada. A string of deaths described as “unprecedented,” SIX, North Atlantic right whales found dead in the Gulf of St. Lawrence Canada. 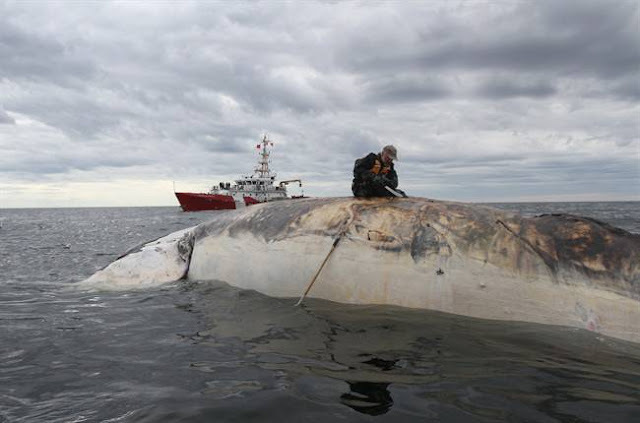 Dr.Pierre-Yves Dumont collects samples from a dead right whale in the Gulf of St.Lawrence in a recent handout photo. A marine mammal expert says the fate of a critically endangered species could hang in the balance with the death of six North Atlantic right whales found floating in the Gulf of St. Lawrence. Tonya Wimmer of the Marine Animal Response Society says the string of deaths is “unprecedented,” amounting to more than one per cent of the 500 North Atlantic right whales believed to be roaming the seas. Wimmer say federal scientists, marine biologists, fishermen and other experts have rallied to get to the bottom of what killed the mammals. The Fisheries Department has sent aircraft and Canadian Coast Guard vessels try to track down the carcasses in the waters near the Magdalen Islands. The Marine Animal Response Society joined an expedition to examine one of the dead whales last Thursday, Wimmer says. Collecting biological samples will be critical to determining what caused the deaths and hopefully prevent further losses, she says, but it will take a “small army” to fully dissect the carcass of one of the whales.